Here's a sale you won't ever see again. It looks like Amazon may have misplaced some Kindles on the wrong warehouse shelf way back when because someone is having a sale today which boggles the mind. 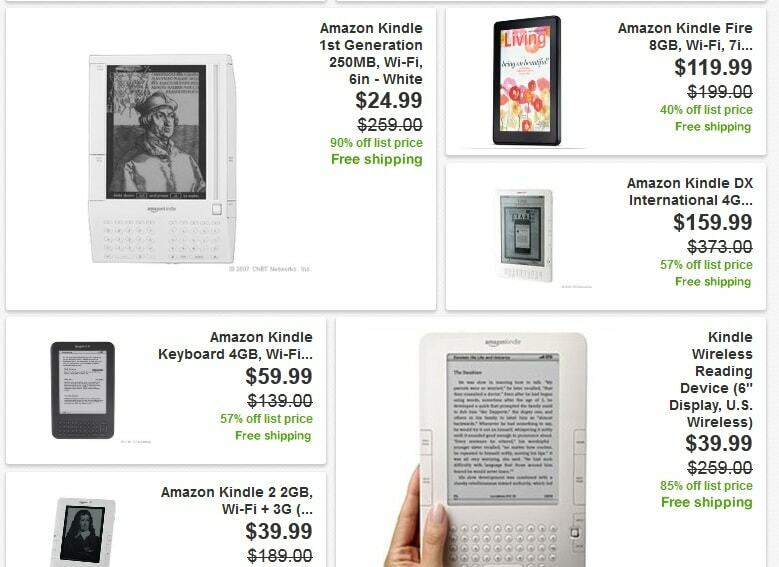 Not only can you find the K4, K3 (Kindle Keyboard), and Kindle Fire on sale, but someone is also selling every Kindle model including the original Kindle, the second gen Kindle (you can even get both the US and international models of the K2). The sales are all refurbs and don't appear to originate from Amazon, but I am stumped by the idea that anyone else would have all this hardware in their warehouse. Seriously, the original Kindle was discontinued over 3 years ago. Where would you be able to get enough to have a sale on Ebay? In any case, the prices on the early models are great. If you've ever wanted to start a Kindle museum, here is your chance. Wow! It’s like Amazon is having a yard sale! Sounds like they literally flushed the entire pipeline of any remnants kept for warranty/paid replacement, returns, refurbs, etc. and sold them to a liquidator. I expect a write-down hidden somewhere in the next SEC filing. Companies usually wait until they have a particularly good (or bad!) FY to do these kinds of big write-off so they don’t have to do them often. They are all refurbs, yes. I forgot to mention that detail. This would be good if they were new, but they are refurbs. My best guess is that they are from a large library eReader program or pilot educational program of some sort that has been discontinued, in which case, you will get a super-used grimy eReader. The Kindles and Nooks at my library are disgusting.